Feature an IP66-68 waterproof rating , with Dust Tight, Environmental Sealing, Anti-Vibration, RoHS Compliant. Available in multiple sizes : A/B/C/D/E/P sizes. Installation Styles available as Receptacle , Receptacle with Cable , Over-molded Cable Assemblies, Field-Attachable, are ideal for industrial, electric, high-performance, power, signal, hybrid (power & signal), military in harsh environments and various other advanced applications. 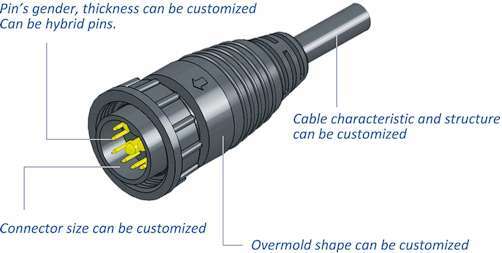 Custom threaded size and pin configurations for your specific requirements are welcome. Mixed Power & Signal Contacts, Available with Overmolded , Field-Installable & Panel Mounting. 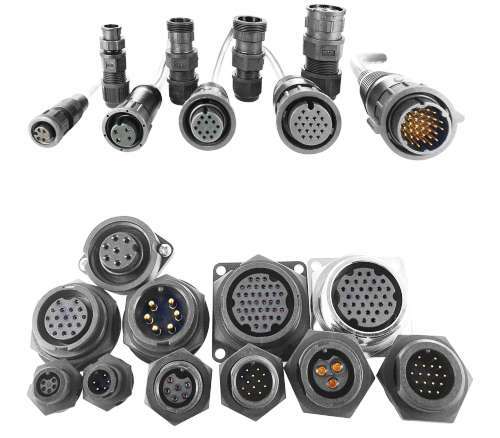 Connector Size, Number and Size of Pins, Cable Assemblies can be customized.